From the Nations Capitol, East Capitol Street runs due east to the DC-Maryland border. Some of the choicest real estate can be found on these blocks, and on rare occasions, a very special property becomes available. 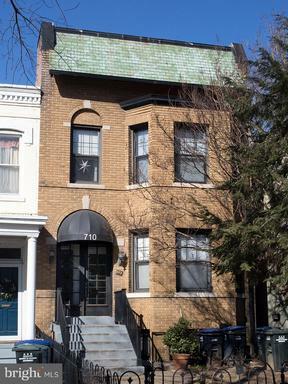 Just six blocks from the Capitol, 638 E Capitol St NE occupies a prominent setting in a premier Capitol Hill location. Facing South, the dwelling enjoys natural sunlight through large windows and top floor skylights. 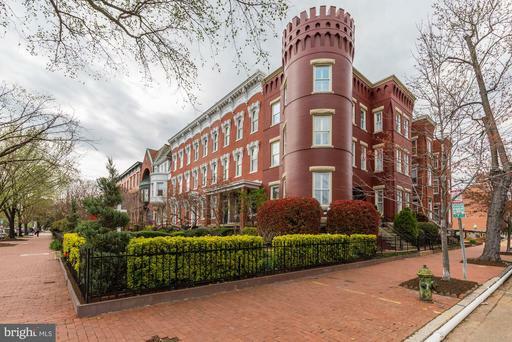 This unique property is one of three towering Victorians often pictures on publications about Washington DC and Capitol Hill architecture. DC tax records date the propertys beginning to 1908, but it is well documented to have been built by Charles Gessford, who died in 1894. Between 1875 and 1894, Gessford, one of the citys prolific builders, built more row houses on the Hill than anyone else. 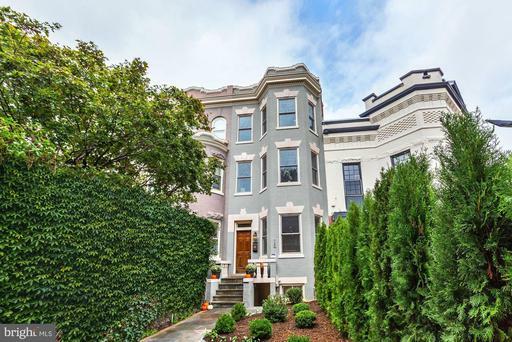 The Capitol Hill Restoration Society counts Gessford-designed properties on 824-832 D St SE and 638-642 East Capitol St SE and NE. Gessfords row houses usually had a square-cornered projecting bay that stretched from ground to sky, always in red pressed brick, and often with stone trim. Gessford further enhanced his most expensive houses with stained glass windows and door transoms and slate roofs. 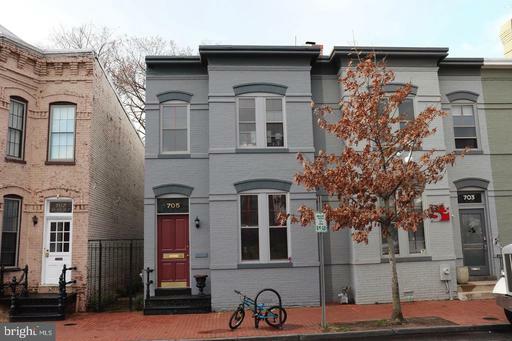 638 E Capitol St NE retains some original details including stained glass accents, exposed brick and woodwork. Throughout, there are modern finishes and architectural touches including coffered ceilings, recessed lighting, gourmet kitchen, marble flooring and multiple fireplaces. 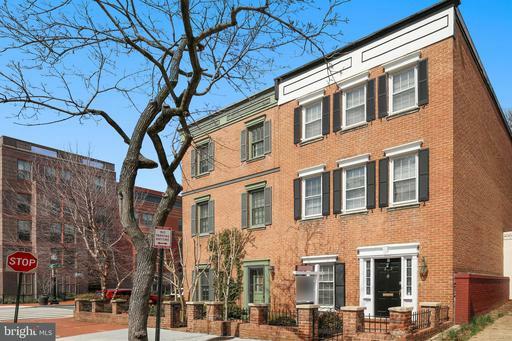 This property also features a finished English basement apartment with its own front and rear doors and a rear brick patio leading to a two story over-sized carriage house. McLean Stained Glass Studios recently restored four of the lovely stained glass panels to their original glory. This much loved home is now ready for new owners to create their own life spaces! 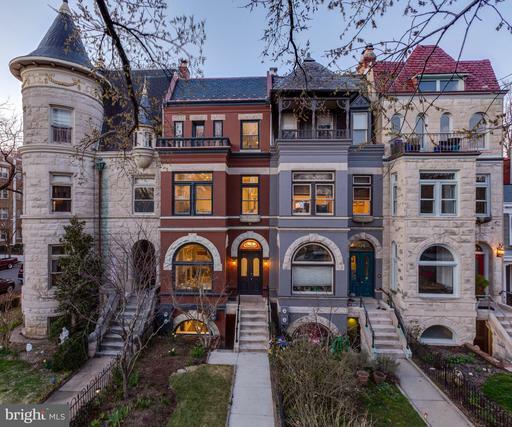 Historic Romanesque Revival mansion originally built in 1896 - restored and renovated in 2018 - 2019. Unobstructed views of the Capitol and Washington DC from rooftop terrace. Modern, architect designed interior with historical features preserved, this 4,066 square foot home has 5-6 bedrooms and 4 1/2 baths. Large kitchen with custom cabinetry, quartz counters, integrated Sub-Zero and Wolf appliances, and lots of daylight from a floor-to-ceiling glass enclosure leading to rear balcony and patio area. Master suite includes walk-in closet and luxurious bath with dual vanities and freestanding soaking tub. Finished lower level with large great room and custom wet bar. 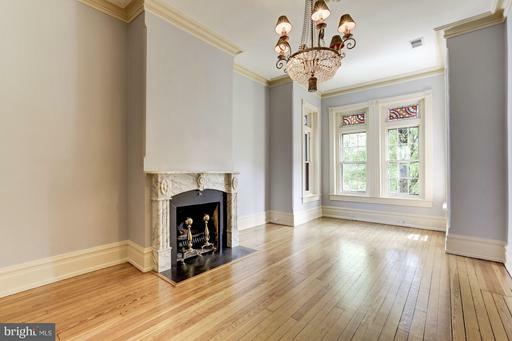 Restored original hardwood flooring and transom windows. 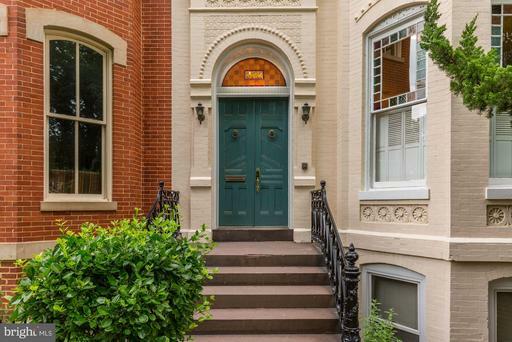 One block to Lincoln Park and steps to Barracks Row, Eastern Market, Eastern Market Metro, the US Capitol, and Supreme Court. 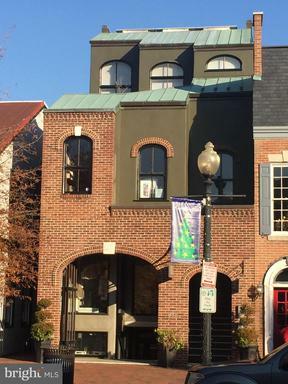 For more information, visit 902eastcapitol.com. 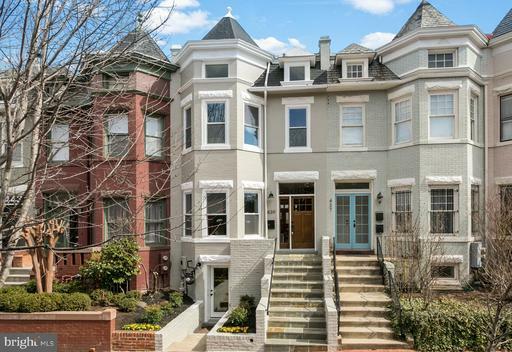 A short stroll from the Capitol Supreme Court, down tranquil leafy streets, sits this handsome and historic 4 bedroom/3.5 bath residence. 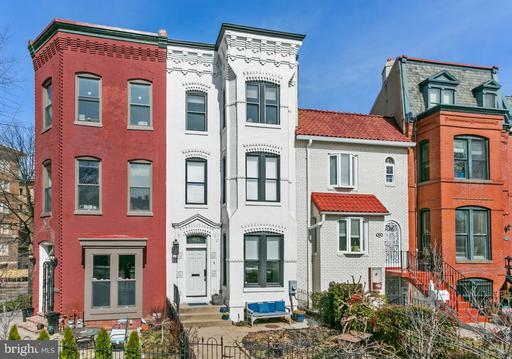 Originally built in 1890, the home is an architectural conversation piece with several styles combined to create a classic DC row home. Lengthy south facing porches on two levels provide a perfect perch from which to watch the world pass by, spring flowers bloom, and autumn leaves change and fall gracefully to the ground. Federal-style double doors in warm burnished wood welcome you and your clients. From the foyer, dramatic arched entryways reveal a refined living space fit for formal entertaining or intimate evenings by the fire. The gourmet kitchen boasts stainless steel appliances and granite countertops reminiscent of Jackson Pollacks No. 32 1950. With the large adjoining dining room, fine meals are effortless for groups large or small. Beautiful original details guide you throughout the home and upstairs to the second level, which features three spacious bedrooms, one currently used as a cozy family room, and full bath. The top level master suite sets you above the neighboring rooftops in a Queen Anne style crown, with a master bath featuring separate shower and tub. A dramatic Art Deco vanity and adjacent walk-in closet, provide more than enough room and storage for two. Below the main living area, a fully equipped lower level in-law suite boasts a separate entrance, ensuring guests independence, and your clients peace and quiet. This house really does have it all- components, character, condition, corner-presence, convenience community. Tremendous space both inside and out with just under 5,000 finished square feet on 3 wide deep levels. Renovated, reconfigured and restored. Updates include new window, baths, central AC, professional landscaping/hardscaping, floors, contemporary fixtures, finishes and more. 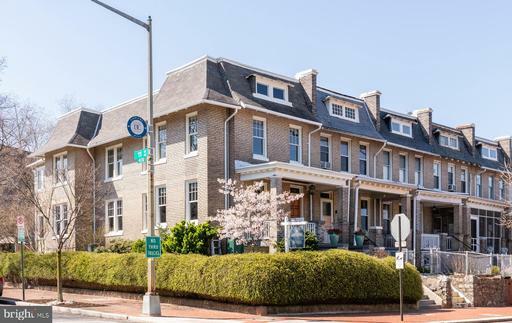 Some architectural elements and highlights include bay windows on the side, turrets on the corner, heart-pine floors, high ceilings and restored marble floors taken from Folger Shakespeare Library. Main level offers a tremendous space with a wall of windows, double Living Room, elegant Dining Room that can seat 15+ and a gourmet Kitchen with versatile space and ample sitting areas, prep/serve areas storage areas. Upstairs is configured as 3 BR with gigantic Master Bedroom and spa-like Bath en-Suite. Front Bedroom with turret bay has the space to easily be divided into 2 separate Bedrooms if you wanted 4 separate BRs on top floor. 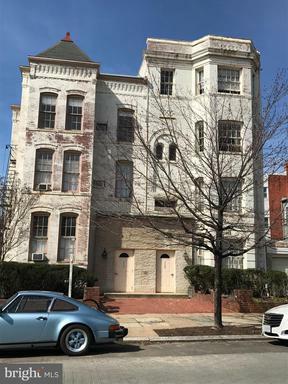 Basement/Lower Level excavated and underpinned to create amazingly tall 9 ceilings with 2BR/1BA rental apartment plus additional BR, BA, Rec Room, storage mechanical for main house. Apartment has Certificate of Occupancy. The rental space could also easily be incorporated back into main house and owners space if dont want to rent. Outside has a reconstructed landing/stairs in front, balcony out back and large fenced-in patio + parking + grass area/garden on the side with hot tub, eating space and plenty of garden/green/grill/storage space. Inbounds for Maury ES. 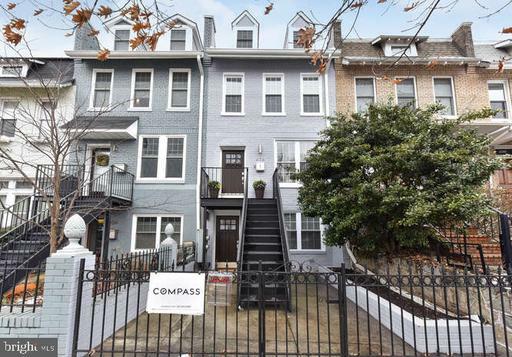 Completely renovated mixed use townhouse on Capitol Hill. Possible uses for an owner occupant looking for a turnkey space with technology upgrades. Plus roof, HVAC and electrical were updated when the building was renovated.The building has a modern feel with contemporary finishes, to include a large glass enclosed conference room. Multiple individual offices on the first and second floors with floor-to-ceiling glass walls that create a sense of openness. The building feels bright with a skylight window and hidden wall lighting.The third floor of the building has two administrative areas and a large roof top deck, great for relaxing. The basement is fully finished with a large, open team room, full bathroom, kitchenette and a lot of storage. The existing office furniture can convey with the purchase of the building.Close to everything on the Hill. Theres a nearby coffee shop, grocery store, multiple restaurants, the Amtrak and Metro. Plenty of street parking or rent parking spaces nearby as the current owners do. Currently used as an office, but zoned as mixed use. Be sure to research the uses as this property has potential to be even more than it currently is. Room count currently is based on property as an office. Room count may changed if property is converted. 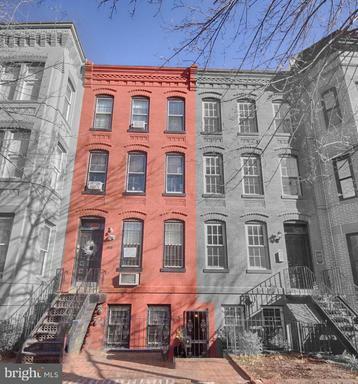 117 12th is an 8 unit building being sold together with the building next door. 115 12th is a 13 unit building. The total price for both buildings is 5,300,000. The buildings are fully occupied except for one vacant unit at 117 12th. All rent rolls, cash flows and disclosures are online. 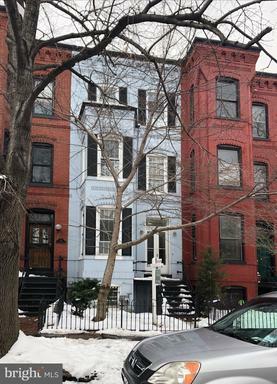 Huge Home Steps from Capitol, House Office Bldgs, Spacious, Deep Backyard PLUS Two Level Carriage House, Large Lot, Vintage 1860 w/ All The Best Parts Still Intact, High Ceilings, HWF Under Carpet, Plaster Crown, Medallions, Curved Banisters, Orig Newel Posts, FP w/ Stone Mantels, TSK, in-Bounds for Brent, Metro, Menus, More! Zoned RF-3, See the Possibilities! This spacious 3,550 square foot, five-bedroom Victorian Bayfront home has been thoughtfully renovated with every detail in mind. The main level features an open concept design allowing natural light to fill the living spaces, dining area, and luxurious chefs kitchen. 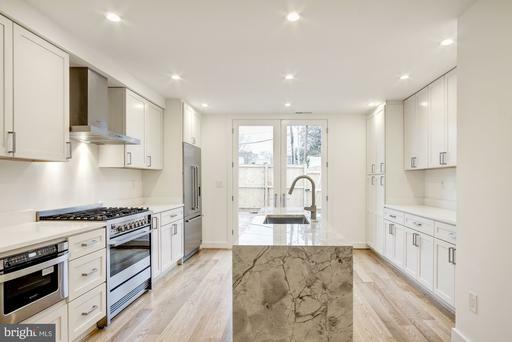 Distinctive kitchen amenities include French grey cabinetry with light quartz counters, an apron sink, Bosch stainless appliances, and a white subway tile backsplash. The dining area includes French doors and a wall of windows that open to a private brick patio. Upstairs there are three large bedrooms including the master suite with lofted ceilings, a sumptuous master bathroom, a sizeable walk-in closet, and a beautiful bay window. The basement includes a kitchenette and can be used as a two-bedroom in-law suite with front and rear egresses or enjoyed as additional living/recreation space. 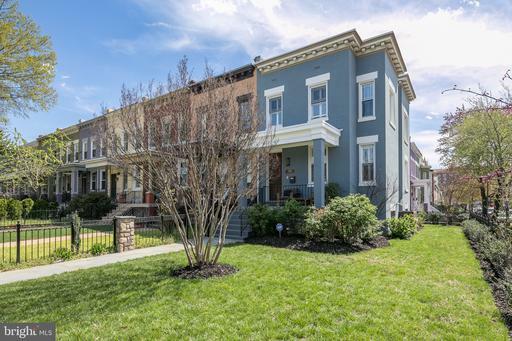 This centrally located historic "Hill" home just blocks to both Stanton and Lincoln Parks and is in the highly desirable Ludlow-Taylor school district. Welcome to this once in a life time opportunity! You can live in your brand new 3900 plus square feet twowith in-law suite unit home and make money, or purchase it as an investment property. 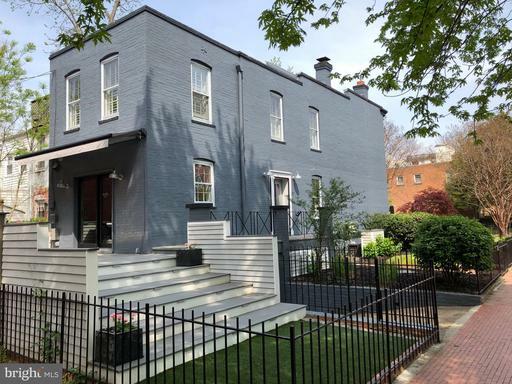 512 Tennessee Avenue NE is a brand new, high quality, fully renovated and redesigned home for comfort and convenience . Everything is new! 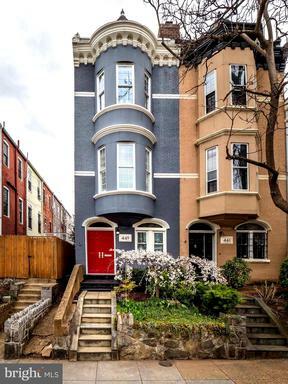 Located in the very desirable Capitol Hill East neighborhood, this property is just blocks from restaurants, theaters, multiple Metro stations, bike trails, the Capitol, Union Station, Eastern Market, The H Street Corridor and everything else Capitol Hill has to offer. You are just a short car trip to 395, 695, 295, and route 50. Amazon headquarters will only be a 5 miles drive from door to door. This fully renovated house boasts 9 bedrooms, 6 bathrooms and tons of outdoor space to entertain. Be your own boss and live on one floor while renting each of the other levels. Each floor should rent for $ 4,200 apiece for short term leases. You can bring in over $12,000 per month! The in-law suite currently brings in $3,000 per month. The one youve been waiting for! 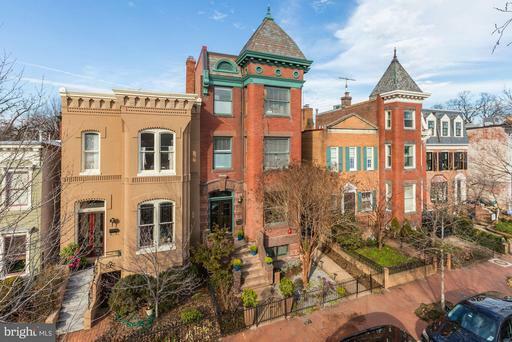 Stunning Capitol Hill row house! Prepare to be wowed by the flowing main level, complete with tray ceiling and chefs kitchen - what a perfect place to entertain! Upstairs boasts four individual suites with top of the line finishes and two private balconies. Lower unit comes equipped with separate entrances, kitchen, and laundry. Live in one and rent the other! Off street parking included. Units are set up to be separately metered, if desired. INVESTOR ALERT! 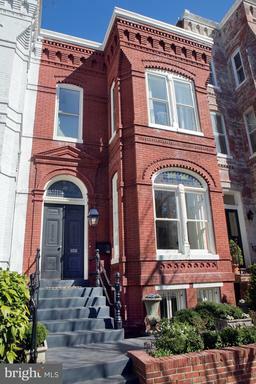 Well located LEGAL FOUR UNIT BUILDING - 3 One BR, 1 Three BR - superbly situated on historic Capitol Hill. 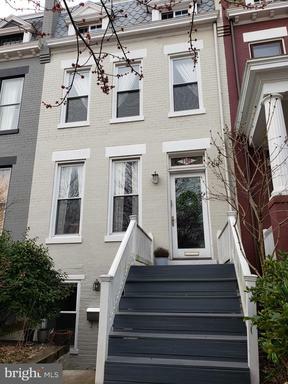 South facing, imposing brick property with deep front rear yards, decks, and a short stroll to the US Capitol, Union Station and happening H ST . Fully Tenanted, great tenants - . Shown by Appointment Only. Steps to Senate, SCOTUS, Stanton Park. In-bounds for CapHill Cluster Schools. 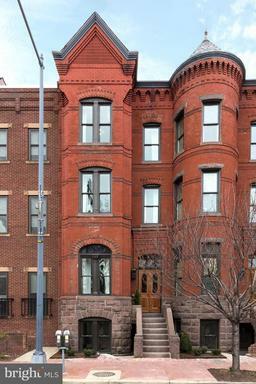 Short stroll to Eastern Market Barracks Row. Classic original features coupled with custom and contemporary updates. DRAMATIC rear expansion featuring a combined stunningly renovated kitchen and family room. Unique split floor plan on upper level with a private oasis as your owners suite. Lower level suite featuring a 1-bedroom with FULL bath. Rear patio is perfectly prepared for public and private time outdoors. NEW PRICE. 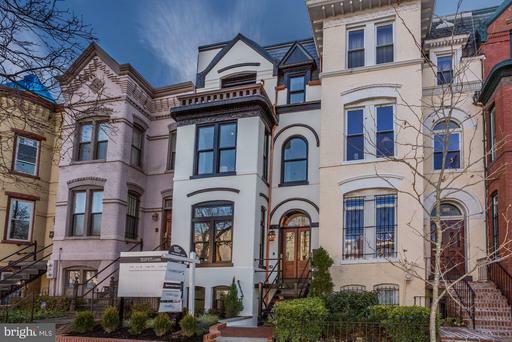 Elegant Spacious Capitol Hill Charmer Steps to Stanton Park. Circa 1892. 5 Bedrooms, 2.5 Baths up w Additional Bedroom Full Bath in Spacious Fully Equipped Lower Level currently rented. Expanded Kitchen w Brand New Sub-Zero built-in Refrigerator, Plenty of Pantry Storage, Gas Cooking, Center Island, Granite Countertops Breakfast Area overlooking Lovely Professionally Designed Garden. Master Bedroom w Skylight Sitting area. Generous Bedroom Sizes. High Ceilings. Three fireplaces. Beautiful detail throughout. Five blocks to the US Capitol, 6 blocks to Union Station. Near Shops and Restaurants. 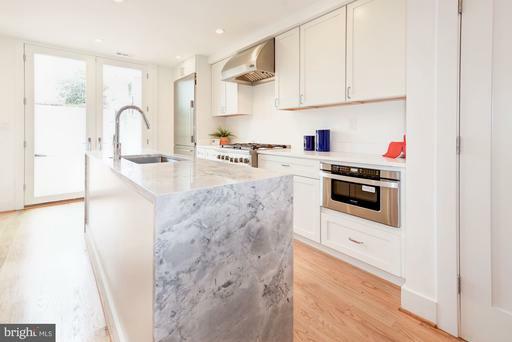 Located just blocks from Stanton Park and the shops at Union Market, this beautifully renovated Capitol Hill townhome is in perfect condition and shows very well. The light filled living room with a gas fire place, wood floors, high ceilings and built-ins is generous in size. The gourmet kitchen is an open floorplan with Wolf, and Sub-zero appliances, marble countertops and has an adjacent dining area leading to the rear entertaining deck and parking. The second story offers two additional bedrooms, an office an additional small bedroom and laundry. The front bedroom has a large en-suite bath. Third floor encompasses the wonderful mastersuite, with built-in closets, vaulted ceilings, and the en-suite bathroom.The large roof deck is accessed off the hall. The lower level functions as a well-appointed guest suite with a full bath, kitchenette and access to the rear garden. OPPORTUNITIES AWAIT! ELEGANT! IMPOSING! 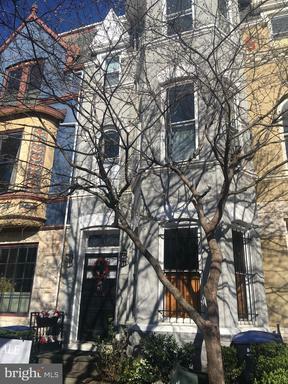 almost 23 foot wide three-story Federal on fabulous BRENT ELIGIBLE BLOCK! 100 FOOT DEEP LOT INVITES NUMEROUS POSSIBILITIES. High ceilings! beautiful wood floors! 4-5 bedrooms! possible parking! 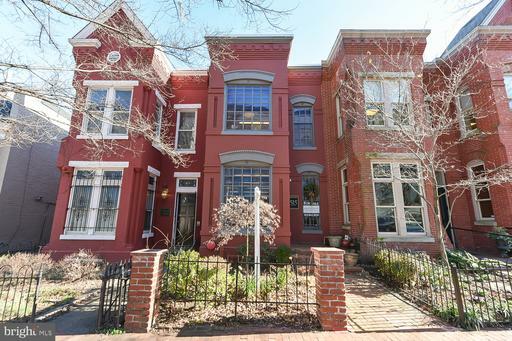 Ultimate close-in LOCATION steps to METRO, Trader Joes, fabulous dining and of course THE CONGRESS! This is a single family property with 3 kitchens waiting to be loved and returned to a magnificent large home. So perfect for the buyer who wants to design his own home renovation! Please call me with any questions. Very special offering! The one youve been waiting for in the epicenter of Eastern Market! Southern exposure and large windows flood this property with light. Main lvl features an expansive open concept floorplan, renovated kitchen w/ SS appliances and granite counters, entry foyer, hall bath, living room with wood burning fireplace, crown moldings and accent mantle, flows naturally past double French doors to a totally private patio and gated off street parking perfect for entertaining. 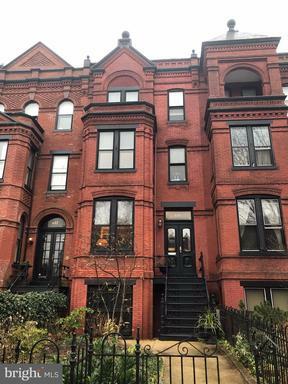 Second floor offers versatility with a massive family room/fourth bedroom complimented by tasteful built-ins, marble capped wood burning fireplace and a huge closet that has potential for another full bathroom conversion. An additional large front bedroom, office/den and renovated full bath make this an intriguing find! To the top floor we go where you will be impressed by the tremendous master bedroom with a third gorgeous fireplace, his and her closets, tastefully updated bathroom with dual vanities and a continuation of the pristine hwd floors throughout this entire home. This floor also features a spacious w/d room with storage and another oversized bedroom with a wonderful city view of Barracks Row! Tandem 2-car off street secure parking included. Location is prime with a 98 WALKSCORE! 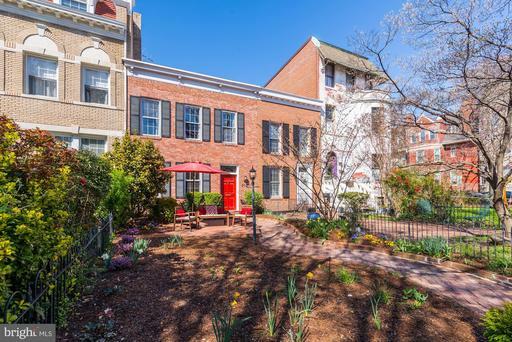 96 steps to Trader Joes, Eastern Market metro, public library-two blocks, mere blocks to acclaimed restaurants: Pineapple and Pearls, Rose~s Luxury and Aqua Al 2, 2 blocks to Rumsey Pool free for DC residents, 2 blocks to Miracle Theatre and much much more! Dont miss out on this one of a kind opportunity! Open House this Sunday, March 31 from 1:00-3:00pm. 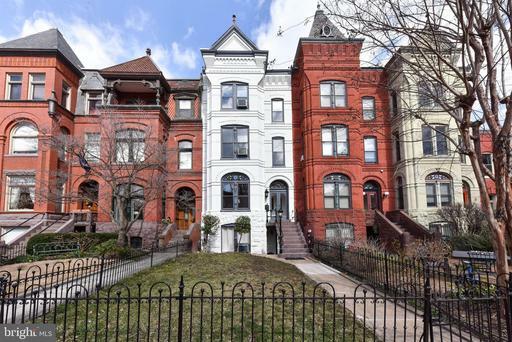 OPEN HOUSE SATURDAY APRIL 6TH 12-3 PM***An elegant gem in the heart of Capitol Hill close to Lincoln Park, Eastern Market, and the US Capitol Building. 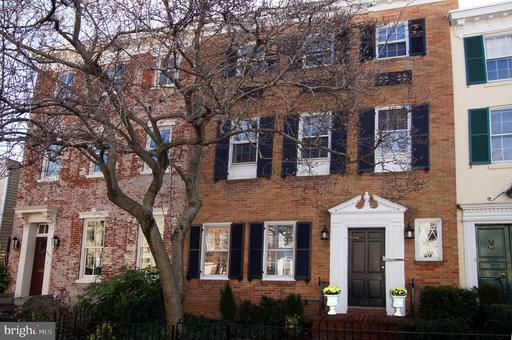 Enjoy this bright and spacious home, with an ideal blend of modern amenities and historic charm. This beautifully maintained property boasts original hardwood floors trim throughout, two wood-burning fireplaces, a gourmet kitchen, a generous backyard with parking. Offers requested by noon, Tuesday, March 19th. 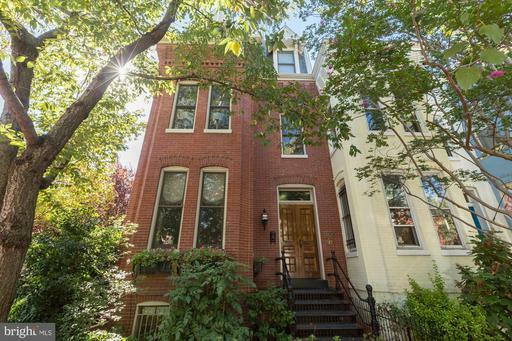 Welcome home to this inviting, Capitol Hill rowhouse that is guaranteed to knock your socks off! The main level features an inviting foyer area adjoining the large living room with wood-burning fireplace. Continue down the hall to the formal dining room and gorgeously renovated kitchen boasting handsome cabinetry and solid-surface countertops. Best of all, this amazing first floor leads out to the home~s stunning private garden and garage. Upstairs you~ll find the Master suite with ensuite bath and two additional generous-sized bedrooms currently used as home offices that share the home~s hall bathroom. The versatile lower level of this home is perfect for the extension of this home~s living space. Or, take advantage of it~s amazing rental income potential for either long-term guests or short-term like Airbnb. 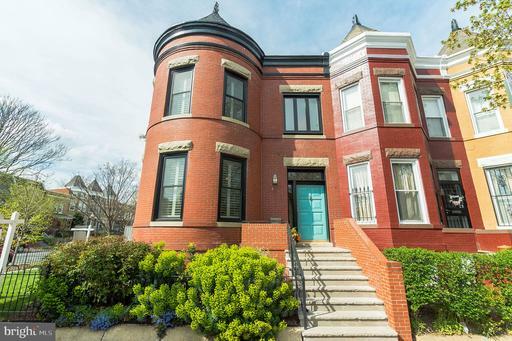 The location, just 1/2 a block from Lincoln Park and just 1/2 a mile from Eastern Market and Metrorail, you~ll never need the car! Enjoy countless restaurants, shops, grocery stores, and parks all at your doorstep! 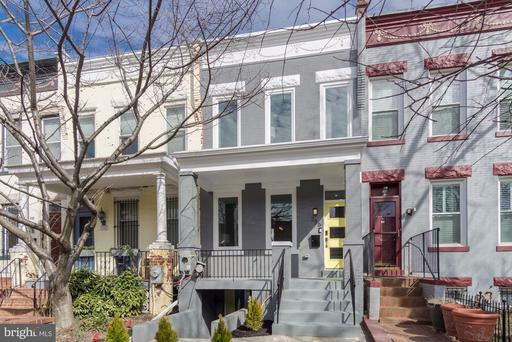 **REDUCED** Come see these two spectacular, fully renovated row homes 320 322 A Street, NE by ORACLE BUILDERS. 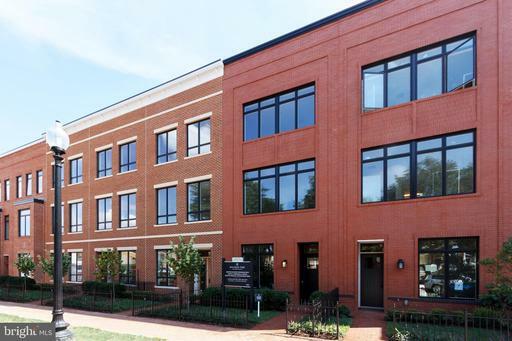 Located just steps from the Capitol and three Metros, both houses feature 3 BRs, 2.5 BAs, open floor plans, gourmet kitchens, hardwood floors and all new systems. Off-street parking. Stone Hill: Style. Sophistication. Space. Located in the heart of Capitol Hill, this gorgeous penthouse boasts herringbone HW floors thru out, Viking stainless steel appliances w/gas cooking, Quartz Gramaco Calacatta Prestige Countertops, Waterwork Rainhead nest thermostat, Danze bathroom fixtures, Walnut cabinets, Butterfly MX intercom, private 1,300 sq ft roof deck with Capitol and Monument views, parking and storage included! Delivering NOW! Amazing Federal located on Premier Corner Lot* Fully fenced wrought iron yard*25 windows w/2 large side bays*2500sf*1 garage w/2 side parking spaces*Enclosed back yard perfect for entertaining*3 full bedrooms, 3 full baths and a main level powder room*Sun soaked throughout*Lower level perfect for rec room or 4th bedroom w/ full bath*Whole Foods, Trader Joes, multiple yoga studios and gyms, The Queen Vic Pub, Granville Moores, Dangerously Delicious Pies*Union Market *Michelin starred restaurant Masseria*Angelique Theaters offers a full bar and meals with your reasonably priced movie selection*Morning commute in the city is a breeze with easy metro access -- bus within a few blocks and either Union Station or Galludet about .5 miles away, National Mall and Smithsonian museums; The Capitol Building and the Supreme Court buildings*9th Street List Service is hosted by one of our across street neighbors who coordinates a monthly happy hour for the group and an annual holiday party either in his home or another member of the List Servs home*Awesome biking location, ride to Nats park or out to the Tidal basin*When the roses and honeysuckle come in later in spring and into the summer the porch is a great place to hang out...Welcome Home! Vets - Assumable VA loan at 3.875 may be available! 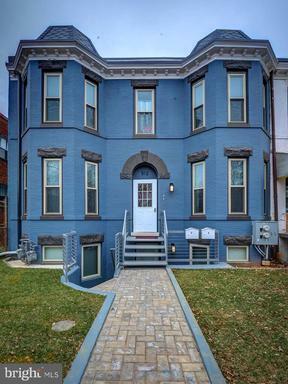 **REDUCED** Come see these two spectacular, fully renovated row homes 320 322 A Street, NE by ORACLE BUILDERS. 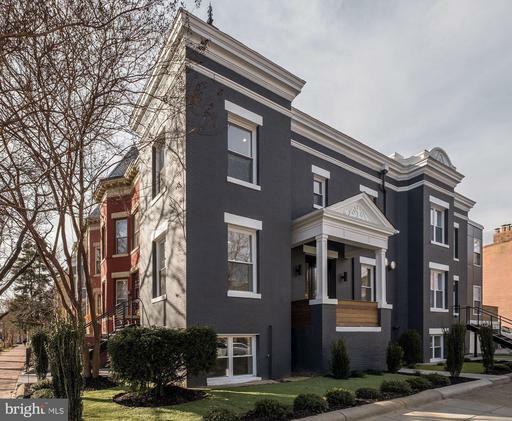 Located just steps from the Capitol and three Metros, both houses feature 3 BRs, 2.5 BAs, open floor plans, gourmet kitchens, hardwood floors and all new systems. Parking available. Photos Coming soon! 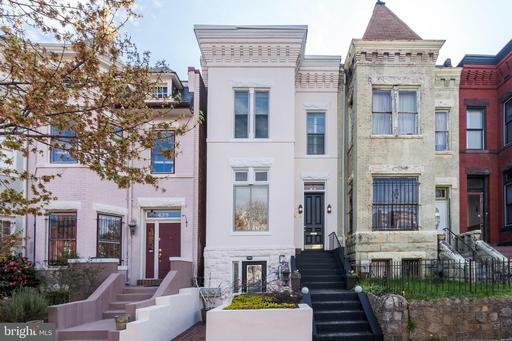 This Classic Four Story Capital Hill Home dotes an incredible view of the Capitol Building- and you cant miss these two gorgeous marble fireplaces. The home was updated for sale with new New HVAC and 2 Zone AC, New Water Heater, New W/D, and all new Kitchen Appliances. Additionally, all bathroom vanities, medicine cabinets and light fixtures have been replaced. The fully finished basement has 7 ft ceilings, full bathroom, front AND rear walk out entrance, as well as access and stairwell to the main home. 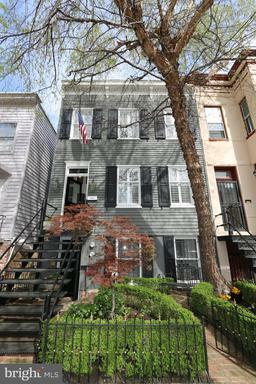 Large, private yard and less than a block from Beautiful Lincoln Park! 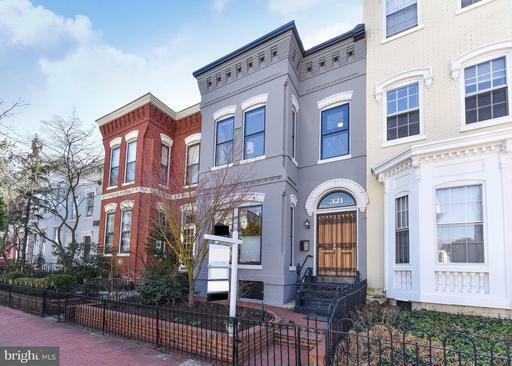 Enjoy Capital Hill with all the amenities and space you could ask for! Listing Broker: Thos D. Walsh, Inc.
Three bedroom, two and one half bath updated charmer on a deep lot, with professionally landscaped outdoor spaces in the front and rear. House features crown molding, hardwood floors, and generous closets. A bright, formal front living room is lit with large south-facing windows and features a wood burning fireplace. The dining room offers a second wood-burning fireplace and leads to an updated kitchen with stainless steel appliances, gas cooking and excellent storage. Off the kitchen is a family room with access to the backyard and rear patio. 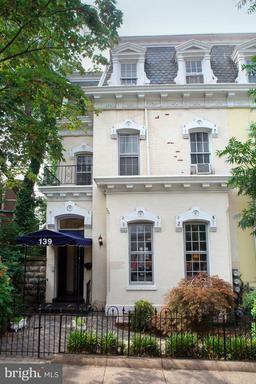 Three bedrooms upstairs, include the king-sized master suite, as well as two beautifully renovated baths. 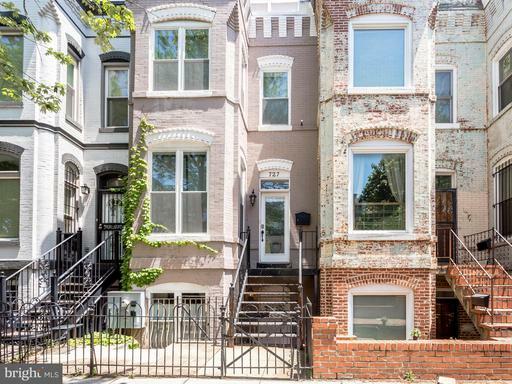 Just steps to Lincoln Park, walkable to Eastern Market and the Metro. Not to be missed! 3 Fully renovated levels. This home features immaculate wood floors throughout and marble tiles in the bathrooms. Sparkling Quartz countertops in the open and airy kitchen with glass cabinets. Vaulted ceilings in the master bedroom along with an attached master bathroom with double vanity. 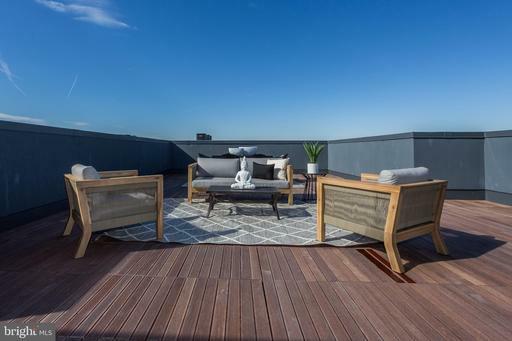 Enjoy watching the 4th of July fireworks from your private rooftop deck with monumental views! Park your car off street in the secured parking. Walkers Paradise!! 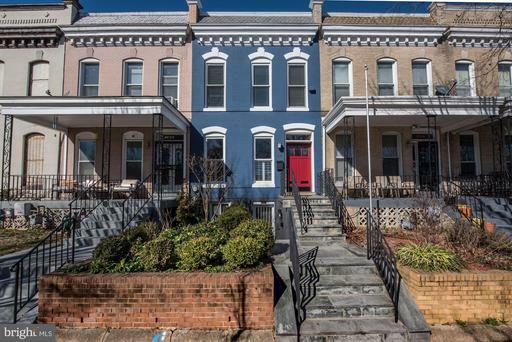 Steps to Harris Teeter and a short 7 minute walk to the Potomac Ave Metro Station. Take a short stroll to the Navy yard. Explore the option of Air BNB for your basement and get $500+ per night. Whats not to love! !